The Uffington Country Show August 24th & 25th for wild aerobatics! Mark Jefferies has been booked to display at the Uffington White Horse Country show near Swindon, also booked is James Dylan with his motor cycle stunt show. Marks display is 13:45 on the 24th. James Dylan’s Stuntworld, the most experienced Stunt Team in Great Britain has something different for 2014, a new style Stunt Show with the latest motorcycles and a remarkable buggy. Gone are the black burn marks left on the arena, the only thing we leave now is the lasting memory of witnessing the most amazing show in Britain. James Dylan (displaying both days) has performed stunts all over the world and accumulated five World Records on the way, his exploits have been shown on various television shows including ‘The Worlds Most Amazing Videos’. Another attraction is “the Festival Circus” Britain’s most successful gala and corporate circus company brings the magic of the circus alive, with a brand-new show each year! The Festival Circus offers up to five hours of circus entertainment, workshops and activities each day, inside our colourful 500 seat circus Big Top. Outside of the show-times, you are welcome to make free use of the circus, perhaps for a band, dance or a comedy night – compare this to the cost of marquee and seating hire – and don’t forget that the comfortable Big Top can guarantee a successful event in our unpredictable summer weather. Monday 25th the aerial display is by the RAF Falcons parachute team. Widely recognised as the UK’s premier military parachute display team, the Falcons, based at RAF Brize Norton, Oxfordshire, display at venues all over Britain and Europe throughout the year. Other attractions are :- Heavy Horses (Sunday) • Old Berks Hunt (Monday) • Falconry Display • Ferret Racing • Clay pigeon and archery (Have a go all levels welcome) • Dog Show (Bring your pooch!) • Natural World • Farms 4 U and more! and much much more!! 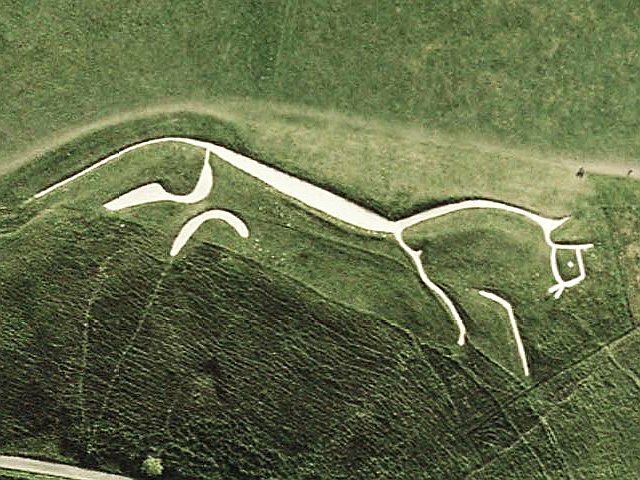 Uffington’s White horse is prehistoric chalk hill “art” measuring 110 meters. Its formed by cutting trenches in the chalk hills in the Berkshire Downs.